When I was getting my start in the business of graphic design, I began life as a sign maker. Yes, mostly with vector graphics and a vinyl plotter, but I lived in that interesting moment in time when the old ways were stepping aside to the new digital age. I had to have one foot into the old world of how we “used” to do things. In my college coursework that meant I actually knew how to prepare “camera-ready” artwork and ink printing presses. I pinched my fingers when it came time to clean rollers and I worried about cutting myself on sharp metal offset printing plates. At work, in the sign shop, it meant that I had to know how to mix my paint to get just the right amount of drag. I couldn’t use too much pigment or else the paint would glob. Too much thinner and the paint would run and lack luster. I look at those days fondly. I learned a lot from my bosses and teachers in those positions. 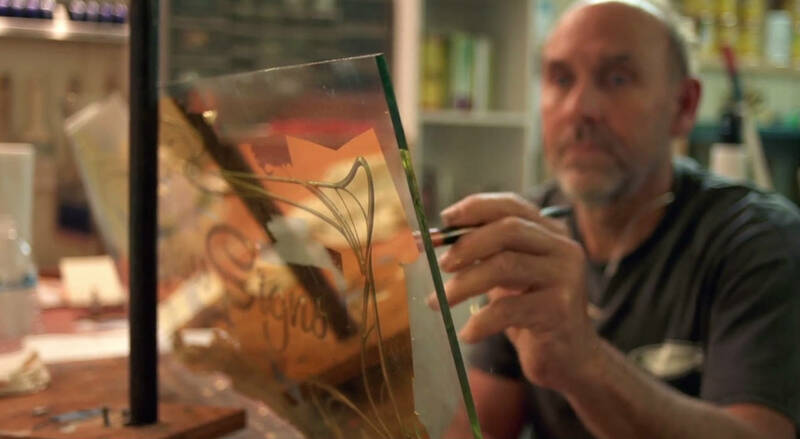 I’ve discovered a fantastic documentary which is sure to interest anyone who has worked in the sign making field – or anyone who appreciates this artistic and dying trade. The trailer is walk down memory lane. This was the most dreaded of all tasks for me in the shop. You took this machine and cranked up the voltage so that you’d get the metal tip to react to the metal table and burn little holes in the stencil paper. You did this so you could chalk whatever substrate you were working on so that you could line up your sign properly. Every time I had to use this tool I expected to die from electrocution. This was an antique, but the only thing we could use to cut sandblasting templates. We would put thick rubber letters onto a foam board and then take that out to the shop and sandblast away the foam leaving the letters raised for painting later. Our Signmaker was capable of receiving commands from our computer, but in the true olden days, you would have had to install fonts using cartridges and type on the attached keyboard. Also, if I remember correctly, this thing weighed 100 pounds. Sign Painters is available on iTunes, Amazon, Google Play. Visit the Sign Painters movie website.